....and this afternoon they are going in the washing machine on a hot wash! They will hopefully look better when they are felted and the final step will be stitching and beads. Come back later and see how I get on! They sell a large range of hand-dyed threads, fabrics and fibres. The colour schemes are amazing - I love these purples and greens. Almost too good to use!! You are so right, it is beautiful on both sides. At a guess I would say the second one is the front, partly because of the outlining on the leaves but also perhaps because the colours are not as intense. I will be back to see the flowers finished. Stef Francis threads are so gorgeous. I am looking forward to seeing the finished felted flowers. The threads are absolutely gorgeous, stunning - like you say, almost too nice to use. 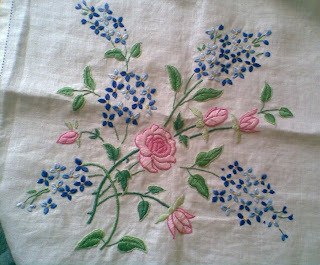 My Nana was an amazing embroiderer too and very particular about her stitching...she never had the patience to teach me though, I was not as neat and tidy as she wanted. Shame really, but I do still enjoy playing around with embroidery (sort of freestyle). Your new threads/fibres and beads are gorgeous and those knitted flowers are stunning - love them! Your felted flowers are going to be fantastic, I can't wait to see them transformed! OMG what a fantastic work. I love them. Gorgeous. You've got all my favourite colours in those Stef Francis threads - they are so lovely and I never tire of using them. I had some for my birthday. Ohhhhhh I am in heaven..... LOVE the fibers, absolutely beautiful, now I want some. I have been looking online for a place in Canada but no luck yet. 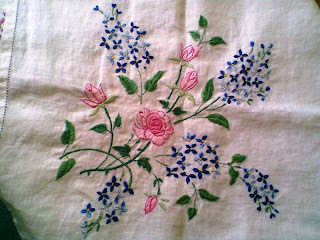 The embroidery is lovely too, that's the thing I love about vintage embroidery, it is always so perfect on the back. Did you learn to embroider at school like I did years ago? Oooh - I have a few lovely posts to catch up on Linda! Your friend Lynne's mum did a incredible job on the tablecloth. I guarantee my stitching isn't that neat on the reverse side. Love the look of your knitted flowers. And they look fantastic felted and beaded too! Love how you try different things. Mmmm....those fibres look edible. Methinks I had better not visit the shop you mentioned just yet as I may go a bit crazy..
Look forward to seeing what you do with them! Wow you have been busy. Another talent of yours it is beautiful. Stef Francis threads are gorgeous. I tend to stop by her stall several times in the knitting and stiching show. I feel like everything she has there. SO gorgeous and how many hours were spent doing that? What a lovely heirloom. Love the flowers and WOW those fibres - I'd love to get my hands on them just to feel them.